I’m excited to be a 3 x finalist in the Australian Photography Awards in the Documentary category this year. The diverse finalist gallery consists of 50 photographs that’s really worth looking at. 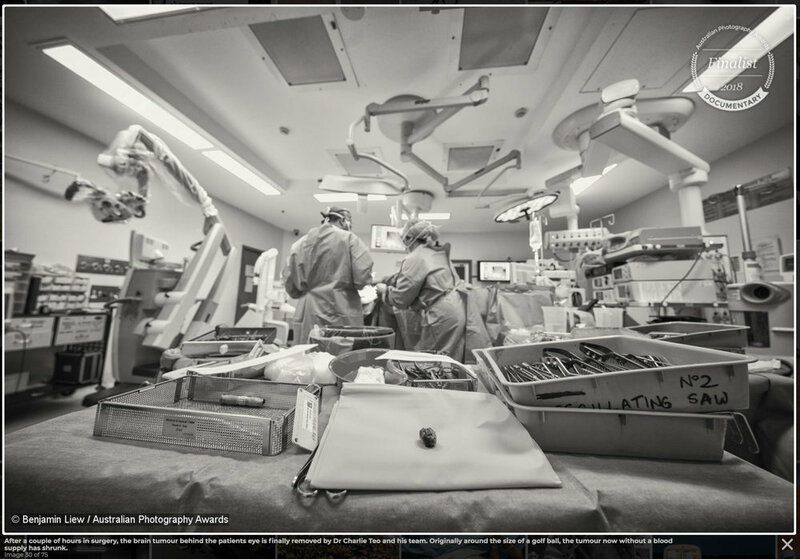 I’m still in awe of what I witnessed a couple of months ago when I had the rare opportunity to photograph Dr Charlie Teo operating on 4 patients needing brain tumours and cysts removed. All 3 of my images are from this day. Congratulations to all the other finalists and especially to David Dare Parker for taking out the category. Dr Charlie Teo performs life saving brain surgery. After a couple of hours in surgery, the brain tumour behind the patients eye is finally removed by Dr Charlie Teo and his team. Originally around the size of a golf ball, the tumour now without a blood supply has shrunk. These are the final stitches after each layer of flesh is stitched up following the removal of a brain tumour behind a patients eye. Dr Charlie Teo skilfully and confidently applies each stitch with as much care and precision that he took to make the first cuts at the beginning of the procedure.